It's well known that religion interferes with communism. I’m sure the construction workers will approve of the new prayer room set aside for them as they build a new beautiful spire minaret. Communism's high priests (called kommisars, Chairmen, Dear Leaders, or whatever) regard people who follow any other religion as heretics to be either brainwashed re-educated or killed. 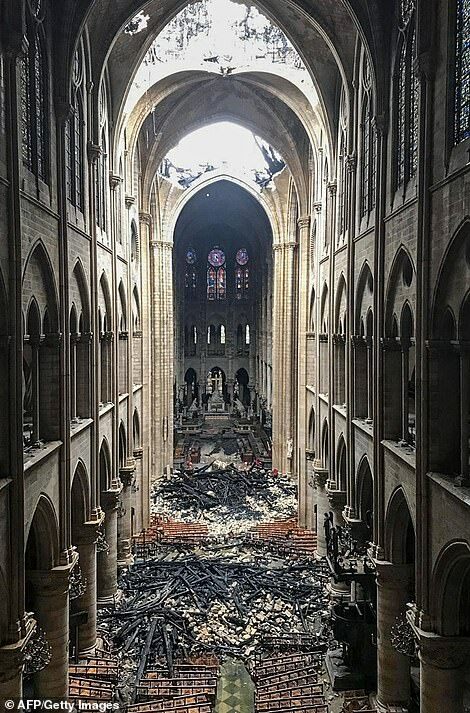 Back to Notre Dame . . . .
As long as we still don't know the cause of the fire, speculation about a deliberate origin is every bit as valid as speculation about accidental origin. And if you're one of the fire investigators, it would be irresponsible to rule out anything this early. So right now, everything from a carelessly discarded cigarette to an islamofascist plot is - and should! - still be on the table. Reports are that there was an initial alarm, firefighters responded and couldn't find any fire so they left, then there was a second alarm a half hour later, by which time the fire was already pretty much out of control. The construction is that there's a stone vault as the ceiling in the sanctuary, then a wooden roof structure covered with sheet lead roofing above the vault, creating an attic. Since the main structure is all stone and can't burn, more than likely the fire originated in the attic space above the vault. It may have started (and the progress of the fire based on photos supports this) in the area where the transept (the two short arms of the cross floor plan) intersects the nave and chancel (the long arms of the cross). The spire, which was under restoration, is (was) located above this intersection. So the fire could have been caused accidentally by one of the workers. Or it could have been started deliberately by someone who gained access to the scaffolding, possibly after the workers had left for the day. So far, decadent billionaire businessmen have pledged 510 million Euros ($576 million) toward the reconstruction of Notre Dame. Although the structure is owned by the French government, it nonetheless functions as a Roman Catholic cathedral. The head of the Roman Catholic Church, the Pope, has pledged ... an historical consultant. Wouldn't she make a better Djali? "Nothing to worry about, folk! Probably just some people doing something at Notre Dame"
There's been a long-running dispute between the Catholic Church and the governments of France about who is responsible for upkeep at Notre Dame. The government say the Catholic Church, because, well, it's a church, and the church says the governments of France, because, well, France owns it. 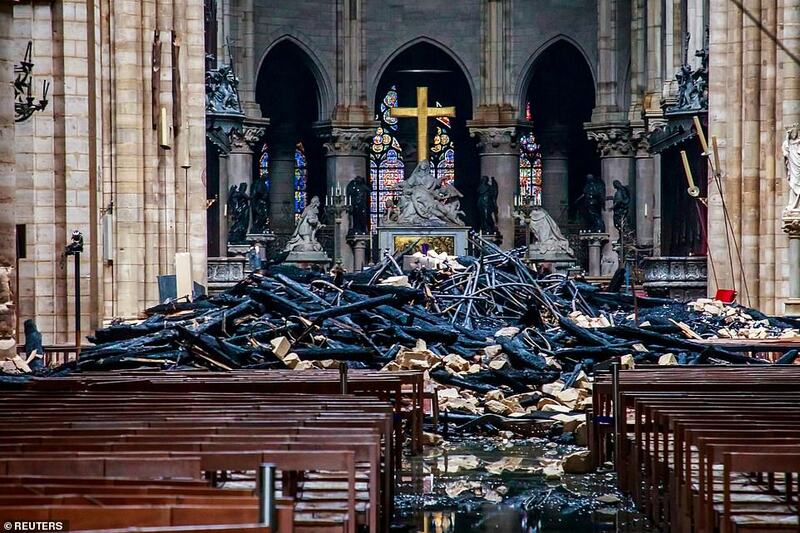 I didn't think of it this way before, but some of the timbers that were used in the roof were saplings when Charlemagne was Holy Roman Emperor in the 800s. Less and less Every. Damn. Day. As accustomed as I am to the claptrap that emanates from Ivy League (especially, but not only) bastions of "higher learning," this statement -- coming from a purported architectural historian -- nonetheless surprised me. As an architect with several years of study in the history or art and architecture, I simply can't imagine any legitimate architectural historian making such a statement, or even harboring such a thought. Western society truly is doomed. I've never been to Paris, but I have this crazy idea the modern "joie" is not all that joie-ful. The Eiffel Tower was constructed between 1887 and 1889. Considering that there is nobody -- in Paris or anywhere else -- who was alive when it was built, I fail to see how it could in any way be considered exemplary of "modernity." Can she show me on the dolly where the mean cathedral hurt her? Purging the scholar class is one of the few things that communism gets right. Newly released France 2018 stats. In Western history, the Modern period is usually thought to begin around 1500, give or take a century. Of course, there are many other definitions of "modern." Interesting. Man stopped from bringing gas and lighters into St Patricks Cathedral. Not releasing his name.